As a subset of biomass l, there are waste streams ill-suited to combustion; particularly, those organic materials high in moisture content. Examples may include, livestock manure, fats and greases, etc. An increasingly popular means of disposal is to digest these materials in an aerobic digester where the bacteria will reduce the waste to a solid, suitable for compost, a liquid which can be used as fertilizer and a gas composed primarily of methane and carbon dioxide (CO2). The gases can be collected and used productively as fuel in an energy conversion project. If the methane is not collected, it will find its way to the surface where it becomes a particularly harmful greenhouse gas with over 20 times the CO2 equivalent impact. If digester operators cannot find a useful energy project, they are left to flare the gas since turning the methane into CO2, water vapor and heat is better than releasing the methane. Not having a viable energy conversion project undermines the value of the digester. Several sorts of energy conversion are possible. The gas can be used to fuel a prime power generator, steam boiler or co-generation project. Depending upon how cost effectively the gas can be “scrubbed” you may be able to inject it into the local gas pipeline. This is highly dependent upon cooperation from the gas pipeline operator and may not be possible in many areas. 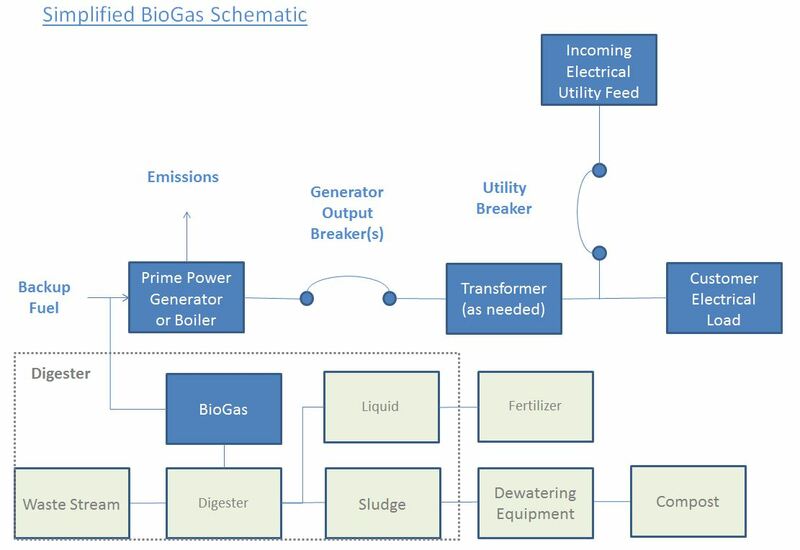 Before considering a significant investment in a biogas project, similar projects should be evaluated for application to your waste stream to determine both the methane content and level of contaminates to ascertain the extent to which corrosive or slagging elements are present. How close are you to a waste fuel source? How much gas can this source produce? Will you need to insource additional fuel types? Will you need a pipeline to get the gas to your site? Are pipelines required to be licensed in your state? What permits and right-of-ways will be needed to install a pipeline? Do you need extra processing equipment to address contaminates? How much capacity can your project support? Will your local utility require an interconnect agreement ? Will you have increased maintenance because of the fuel source? What is the impact to your facility, if the biogas is unavailable? Are the utility incentives for green energy? If a biogas energy project looks like a fit for your project, contact IEA and one of our experts can guide you through the project screening and development processes . IEA can own, operate and maintain your biogas energy project or provide a turnkey solution with asset management services to support ongoing operations and maintenance for projects owned directly by customers.